– How on earth does Michigan wind up as a 5 seed? There are also a few huge upsets in this tournament, most notably in the East Region (the top left, as it were): UC Irvine over Michigan and South Dakota State over Villanova. Despite the seeding difference, UCI over Michigan is probably the bigger upset – SDSU is perhaps underseeded as a 14, but their resume mandated it as they didn’t win the Summit regular season title. Meanwhile, Michigan is still viewed as a really good team even with their spectacular collapse to end the season (but again, more on that later). Meanwhile, the two biggest upsets of the entire tournament, by percent chance of winning, were actually in the second round. You can probably pick out which two – they end up playing each other in the Sweet Sixteen in Anaheim. Gonzaga’s defense, while still quite good, has been their weaker side of the ball this year, and it fails them as TCU puts up 86 on them in a 86-77 victory in round 2. Not such a tidy story for Virginia Tech, but they drop their second-round matchup with one of this year’s scarier mid-majors, Hofstra. Alright, on to the conference reviews! 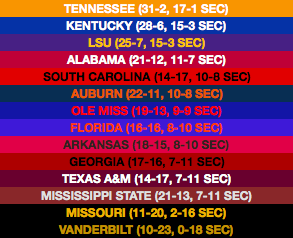 It’s a difficult end to the season for a lot of the SEC’s contenders, but the top three teams all look fantastic. Currently, the gap between Tennessee, Kentucky, LSU and the rest of the field is two games, and it becomes four by the end of this run. The most surprising downside here is that of Ole Miss – currently considered a decent bet for a tournament bid, they lose five of their last eight regular season games, including an embarrassing walloping at the hands of South Carolina, and fall to Georgia in their first SEC tournament game. 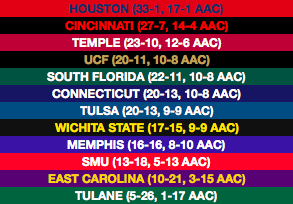 Even at 9-9 in what is the fourth- or fifth-best conference in the country, they actually didn’t even make the NIT. Rivals Mississippi State, on the other hand, actually still make the tournament despite finishing 12th, aided by a run to the conference tournament semifinal, with wins over South Carolina and Alabama in the process. Not just the Duke and Virginia show here, folks! 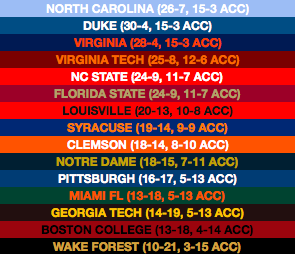 It’s North Carolina that comes out on top in the ACC this time round, although it’s done via tiebreaker over the two more highly-regarded teams. They win that tiebreaker by virtue of having swept the rival Blue Devils, in case you’re wondering where Duke’s two other conference losses came from! All three teams enter the ACC tournament angling for #1 seeds, and Duke’s the only victor in both cases. Duke/Virginia III happens to be in the semifinal due to the seeding seen above, and it looks like the best game of the three, with Duke winning by a basket. Carolina doesn’t get the chance to beat Duke a third time, coming a game short of the final (just as would eventually happen in the NCAAs). It’s a tough end to the season for Louisville, who still has to play Duke once and Virginia twice, and loses them all here, but also loses to Notre Dame and Syracuse en route to a 10-8 record. I don’t think they’re going to fall out of the tournament bracket no matter how badly they finish, but seeing them as a 9 seed has got to be disappointing. Nothing says “best conference in the country” quite like having an eighth-place team who makes the Elite Eight, and that’s the story of the Horned Frogs this time. It’s actually a really disappointing end to the regular season (losing 7 of 8), and there’s some doubt as to whether they would’ve otherwise gotten into the tournament, but they remove all doubt by beating three of the league’s top four seeds in a 3-day span and dramatically improve their seeding in the process. Beating Gonzaga after that is just the icing on the cake. K-State just holds on to the conference title despite losing three of their last five regular season games, including one to Oklahoma State. 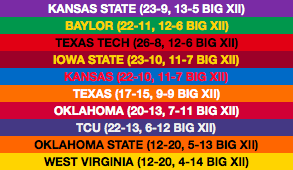 It’s looking more and more like Kansas actually isn’t gonna win the Big XII in 2019 – they’re not mathematically eliminated until March 4, but it’d been a formality for a while. The most interesting result of this Season Sim is the complete and utter collapse of Michigan. Their remaining schedule looks like this: at Penn State, vs Maryland, at Minnesota, home for Michigan State and Nebraska, and finish with away games to Maryland and Michigan State again. How does 0-7 sound? I agree that it isn’t likely, but it’s possible, and here it happened. 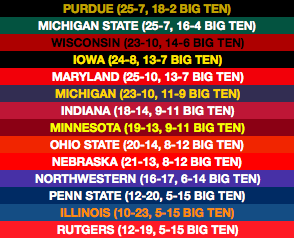 Purdue wins out in the meantime, so the near impossibility of Michigan finishing seven games out of the Big Ten title actually comes to pass. Nebraska, meanwhile, is one of those teams that looks a lot better to predictive metrics than its résumé might suggest, so if there’s any team in the country that’s going to finish tenth in its conference but win an automatic bid anyway, it’s them. They win the Big Ten tournament by beating four tourney-bound teams in a row, finishing with the Terps in the final. 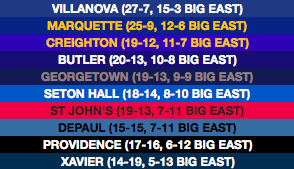 I don’t think we’re going to have a Season Sim left this season that doesn’t have Nova and Marquette atop the Big East, in whichever order. Those two have a collective four-game lead over the chasing pack of five 5-6 teams currently, so even if one of those teams falls apart down the stretch, like Marquette did here, it doesn’t really matter. Villanova took the lead for good by beating Marquette in the return matchup, & coasted from there. Marquette snapped a four-game losing streak in the conference tournament quarterfinal, and nearly won the thing. 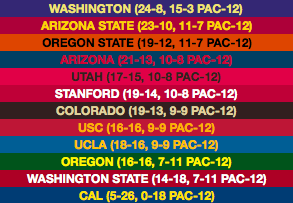 Not much changes about the Pac-12’s fate from here to March, with Washington winning the league by several games. You have to imagine the league’s brass desperately praying that someone other than Washington or ASU wins the league’s autobid, but it’s not to be. ASU caps their first time winning the Pac-12 tournament by beating Arizona for the third time, and just the top two get in. Arizona themselves is a #1 seed in the NIT. I showed you up at the top that Houston was chosen as the fourth #1 seed, and it’s easy to see why – they win out through the season, including an absolute dismantling of Cincinnati in the tournament final. I don’t think anyone thinks or would think that they’re actually one of the four best teams in the country, so this would probably be contentious, but at 33-1 I think it’s not controversial that they’d have one of the four best résumés. In an all-ACC matchup, NC State beats Clemson to win the NIT, with Arkansas and Lipscomb also participating in the semifinals at MSG.